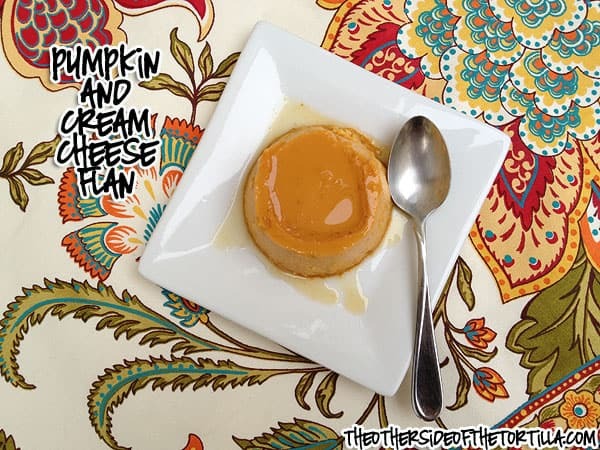 Pumpkin flan made with cream cheese is a decadent alternative to pumpkin pie or other Thanksgiving treats if you’re looking to add a little Mexican flair to your holiday table. 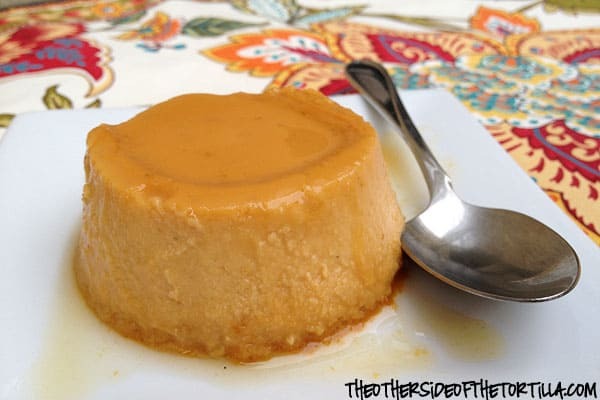 In fact, pumpkin flan is a dish I’ve added to our family’s holiday traditions only in recent years but it’s often gobbled up faster than the pumpkin pie and other available desserts. There may or may not even have been a fight two years ago over who got the last piece! This recipe is for small, individual-sized portions, baked in ramekins. You can double the recipe if you have more guests. I like to use these souffle ramekins from Cost Plus World Market that are 3.5 inches across and about 2.5 inches deep. If you prefer to make one big flan, depending on the depth of the dish, you may need to adjust the baking time. It’s also a little more substantial with a thicker consistency than most flan, so it’s best to let it sit out for about 15 minutes before serving. Another little trick I use is to loosen the flan with a very sharp knife while the ramekins are still warm (but cool enough to touch) to help with getting them out of the ramekin easily. Pumpkin puree gives traditional flan a twist for Thanksgiving. Add all ingredients for flan into a blender or food processor and blend until completely smooth. In a small saucepan, make the caramel by bringing the 1/2 cup of sugar mixed with 1/4 cup water to a boil over medium-high heat, constantly stirring until the sugar begins to turn a caramel color. Once the sugar turns color, immediately remove from heat and pour evenly into bottom of ramekins. Use a spoon if you need to spread the caramel, but you'll have to be fast because the caramel will harden quickly. Pour contents of the blender into the ramekins. Place ramekins in a casserole dish with a water bath that goes about a third to half way up the side of the ramekins. Bake at 350ºF for about 45-60 minutes or until a toothpick comes out clean from the center of the custard. When they're finished baking, remove the ramekins from the water bath and place on a cooling rack until they reach room temperature. Loosen around the edges with a sharp knife. Refrigerate until ready to serve. Invert ramekins over dessert plates. Garnish with fresh herbs such as thyme or rosemary if you like. What kind of Mexican dishes have you added to your American Thanksgiving that have been a hit? Tell me below in the comments! Qué delicia!! Una de mis grandes debilidades es el flan! ps. love the new save/print recipe thingy. So handy. Maura, what an awesome combination, it is an ideal for fall desserts. I am just thinking how it would taste with a sprinkle of pumpkin pie spice. I am glad to visit your blog. How many ramekins does it make? I need to make this! !